Welcome to Big Sky Country. This is Montana. Vast plains stretch across the eastern part of this state, and when those plains go on for miles and miles and miles, so does the sky. Huge herds of cattle graze on the prairies. Montana has buffalo, too, and in the National Bison Range, on the Flathead Reservation, buffalo roam a 20,000-acre national wildlife refuge. The western portion of this great state rises up in tall, rugged Rocky Mountain country. These mountains have provided Montana its name, and yielded a fortune of gold and silver since the first substantial deposits were discovered in the early 1860's. Today, the mountains attract people for their natural splendor. Glacier National Park is a destination for many, with majestic peaks shaped by massive glacial ice. Rising cliffs and waterfalls offer spectacular beauty here. And Montana's Yellowstone National Park delights visitors with incredible scenery, waterfalls, geysers, and lakes. That's Montana! Created out of the Idaho Territory in 1864, the name Montana is a derivation of the Latin word "montaanus" which means mountainous. One of the more popular nicknames for Montana, "The Treasure State" or "Treasure State" legend was featured on standard license plates from 1950 to 1966. 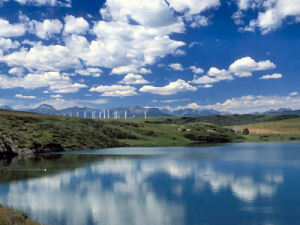 Montana is referred to as the "Treasure State because of its rich mineral reserves. Mining has been an economic cornerstone of the state and the state's motto "Oro y Plata," Spanish for gold and silver, refers to two of the minerals that gave rise to the nickname. Like "The Treasure State," this nickname highlights Montana's mineral wealth. This name is said to have been given to the state by Judge John Wasson Eddy and is in direct reference to Montana's many "bonanza" mines. A relatively recent nickname, "Big Sky Country" originated with a 1962 promotion of the Montana State Highway Department. It is a reference to the unobstructed skyline in the state that seems to overwhelm the landscape at times. The name came from a book by Alfred Bertram Guthrie Jr., Big Sky, recalled by a Highway Department employee. Mr. Guthrie gave the Highway Department permission to use the name and Montana has been "Big Sky Country" ever since. The legend "Big Sky Country" appeared on Montana license plates from 1967 to 1975. This was shortened to "Big Sky" on license plates stamped from 1976 to 2000. This is another reference to the mineral wealth of the state of Montana with a toast to its mountains in the west. This nickname, of course, refers to the mountains of Montana. 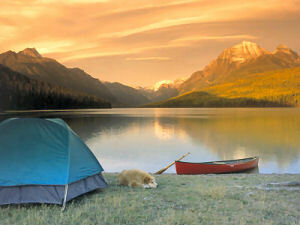 This nickname again refers to Montana's rugged, mountainous terrain and offers a human connection. Ouch! Montana is known as the headwaters state because much of the water which flows to the rest of the nation comes from the mountains of Montana. Two of the nation's major river systems, the Missouri and Columbia, are born high in the Rocky Mountains of Montana. People who live in Montana or who come from Montana are called Montanans. The first commemorative quarter-dollar coin released in 2007 honors Montana, and is the 41st coin in the United States Mint's 50 State Quarters® Program. 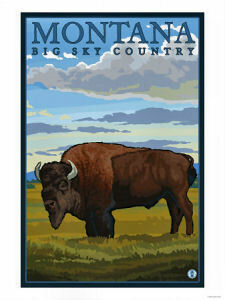 Montana, nicknamed "Big Sky Country," was admitted into the Union on November 8, 1889, becoming our Nation's 41st state. The reverse of Montana's quarter features a bison skull depicted above the diverse Montana landscape with the inscription "Big Sky Country." The coin also bears the inscriptions "Montana" and "1889." 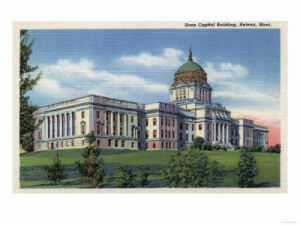 The recommended design was chosen based on feedback from the Montana Quarter Design Selection Commission, which was created by Governor Brian Schweitzer, and a subsequent public vote. United States Mint sculptor-engravers and artists participating in the United States Mint's Artistic Infusion Program rendered the "Bison Skull" design and three others submitted to Governor Schweitzer. The designs were based on narratives submitted by Montana residents. Montana (From Sea to Shining Sea) , by Judith M. Williams. 80 pages. Publisher: Children's Press(CT) (March 2002) Reading level: Grades 3-5. Presents information about Montana's people, geography, history, landmarks, natural resources, government, state capitol, towns and cities, and more. Montana (World Almanac Library of the States) , by Kris Hirschmann. 48 pages. Gareth Stevens Publishing (February 2003) Reading level: Grades 4-6. Filled with the most up-to-date information, including the latest Census results. Full-color photos bring to life the story of Montana. In addition to an in-depth factual profile of Montana in the form of a state Almanac, this book offers fascinating and lively discussions of the state's history, people, geography, government, economy, culture, and lifestyles. A section on Notable People, a calendar of events, and enough primary source documents, time lines, maps, and other tools to make this unquestionably the best young adult reference material on the USA available anywhere. Montana Almanac , by Andrea Merrill-Maker. 384 pages. Publisher: Globe Pequot; 2nd edition (December 1, 2005) What is the only Montana newspaper to win a Pulitzer Prize? Which are more numerous in Montana-humans or cows? Which county produced the most barley-6,955,000 bushels-in 1995? How many Montanans does it take to make a pet cremation urn? Who's won more Big Sky Conference championships in football-the Grizzlies or the Bobcats? Where was General Thomas Meagher, acting governor of Montana Territory from 1865-67, last seen before he mysteriously disappeared? These and thousands of other questions are answered in Montana Almanac by Andrea Merril, a former legislative researcher, and Judy Jacobson, the former state senator from Butte who ran for lieutenant governor and governor in 1996. Readers will find Montana Almanac an indispensable fact book that should grace the shelves of every Montana household, office, classroom, and library. These 504 pages contain 189 tables and graphs, 27 maps, 135 photographs, 75 biographical sketches of notable Montanans, and mountains of facts on Montana-its history, people, natural treasures, weather, government, education, media, agriculture, business, roadways, sports, recreation, and arts. A comprehensive index puts all this information at your fingertips. Montana: A History of Two Centuries , by Michael P. Malone, Richard B. Roeder, and William L. Lang. 466 pages. Publisher: University of Washington Press; Revised edition (November 1991) Montana: A History of Two Centuries first appeared in 1976 and immediately became the standard work in its field. In this thoroughgoing revision, William L. Lang has joined Michael P. Malone and Richard B. Roeder in carrying forward the narrative to the 1990s. Fully twenty percent of the text is new or revised, incorporating the results of new research and new interpretations dealing with pre-history, Native American studies, ethnic history, women's studies, oral history, and recent political history. In addition, the bibliography has been updated and greatly expanded, new maps have been drawn, and new photographs have been selected. Roadside History of Montana , by Donald E. Spritzer. 432 pages. Publisher: Mountain Press Publishing Company (May 1, 1999) Roadside History of Montana goes well beyond cowboy stories to tell of the struggles of dryland farmers, the rowdy antics of mining-town denizens, and the heroism of smoke jumpers and park rangers. Author Don Spritzer's love of Montana in all its diversity shines through in each vignette as he introduces readers to Montana's independent, adventurous, and often eccentric people. Readers will learn surprising facts about the Treasure State's past and meet its most fascinating people, from the copper kings of Butte to the Freemen of Garfield County. Dividing the state into six geographical-historical areas, Roadside History of Montana follows main highways to reveal the stories hidden within the vast Montana landscape, delighting readers with lively anecdotes along the way. Spritzer speaks of each little town and crossroad with the intimacy of someone who's been there--and indeed he has. Accentuating the text are 170 historical photographs and numerous maps.